Anna is happy in Atlanta. She has a loyal best friend and a crush on her co-worker at the movie theater, who is just starting to return her affection. So she's less than thrilled when her father decides to send her to a boarding school in Paris for her senior year. 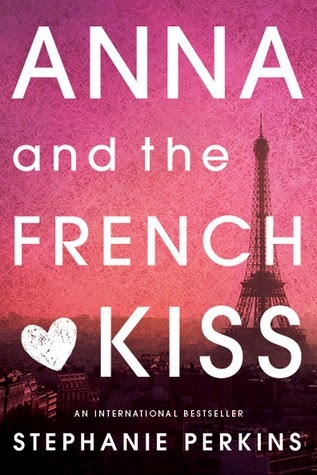 But despite not speaking a word of French, Anna meets some cool new people, including the handsome Étienne St. Clair, who quickly becomes her best friend. Unfortunately, he's taken —and Anna might be, too. Will a year of romantic near misses end with the French kiss she's waiting for? First off, To be honest I was putting this book off for a while.. Me and contemporary's do not get on very well. Just about every contemporary book I have read were not my favourites. So anyway, I saw this book in the Warehouse for only $10!!! Which is pretty cheap for New Zealand books! So I picked it up along with the sequel Lola and the Boy Next Door, and I read it. This book is so ADORABLE. All the characters are so amazing! ( Well except for some of them ) :P I loved Anna and I loved St. Clair. The romance in this book was on point and it's so beautiful! I had many fangirly moments throughout this book. This whole story makes me want to go to Paris! Even more than I already did want to go! If you are looking for a cute romance story, this is definitely the book for you! Stephanie Perkins has done such an amazing job on this! I rated this book a 5/5 stars!